Charlotte artist Sharon Hockfield offers a unique service to brides (or generous friends/family wishing to give the best gift ever!). She paints abstract portraits of her clients, capturing the couple's style and wedding colors in oil paintings... fine art to be treasured for generations! We put our heads together this spring to market these creative commissions and came up with this card. 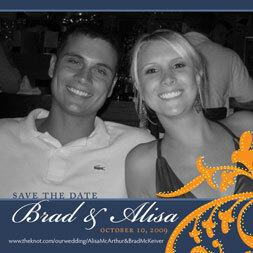 Though I started this design gig creating stationery for originality-oriented brides, I don't do many weddings these days. Most of my friends have been married off and my fascination with the formalities and traditions in weddings has seemingly passed. But when your way-back friends come calling with their tales of newly-found loves, it is a privilege to help them translate that sweetness into an invitation to join them in their celebration. 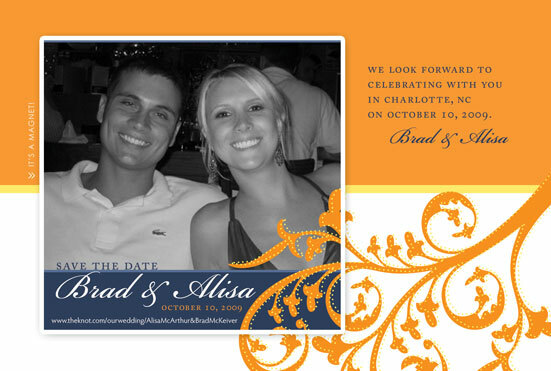 This lovely couple and I anxiously await shipment of these fun Save-The-Date cards. We are having a 3.25" magnet printed as well and will attach it to the card. The recipient can pull of the magnet and stick it to the fridge, leaving a card that is printed with the same photo. I love the colors they have chosen for thier wedding and think this design is going to work beautifully for the rest of their wedding ensemble.